I cannot even begin to express to you how much I LOVED working with Natasha and Huston. This couple was as sweet and low-maintenance as they get. Natasha gave me a few inspirational photos and basic guidelines and then let me take it from there. This couple barely knew what to expect at their wedding…what a relief that they loved it!! MICHAEL ALLEN HARRISON, AARON MEYER and JULIANNE JOHNSOn performed the ceremony music…AMAZING. If you’ve ever seen the benches at The Grotto, you know that they are not overly attractive. So…we brought in custom damask pads to match the wedding’s design scheme. The bride wanted “purples” and “orchids.” I think she got what she asked for!! Huston surprised Natasha by learning “I Wont Give Up” by Jason Mraz and performed it at the reception. 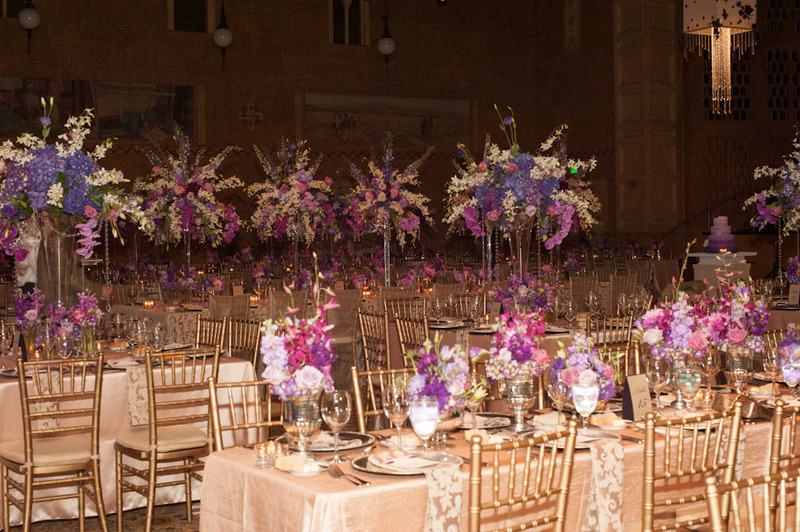 For the first dance, the dance floor gobo matched invitations and menus, and the hanging chandeliers were custom made. Also, As a nod to Natasha’s Lebanese heritage, we brought in belly dancers to perform!